St Mary’s is the ancient Parish and Civic Church of Nottingham. The present building, over 500 years old, is believed to be at least the third church on the site. In 1086 a church was mentioned in the Domesday Survey. It was clearly a royal church, described as “within the King’s lordship” with about 75 acres of land, extensive property giving a good income and a priest named Aitard who had a croft of 65 houses. St Mary’s Church was mentioned by name twenty years later (1103-8) when it featured in the foundation charter of Lenton Priory. The church was handed to the Priory by Castle governor William Peveril with St Peter’s and St Nicholas’ churches, newly built by the Normans. After Aitard the Priest in 1086, there is a gap in the list of St Mary’s vicars until 1228. Part of this time the church was being rebuilt and Lenton Priory may have maintained monks to administer the church, however research at Nottingham University has uncovered the names of a number of early vicars, some with far-reaching connections, one the nephew of a Pope. During the disturbances in the 12th century Nottingham was burnt down three times and all three churches destroyed and rebuilt. Evidence of the Norman church, built to replace the one destroyed by fire, appeared in 1843 during excavations when repairs were carried out to the present building. The beautifully carved capitals from previous pillars (evidence that it was an aisled church) were still coated in brilliant red, blue and gold paint. The moulded stones and fragments of zigzag mouldings from the Norman arches, and the colourful floor tiles that had adorned the interior of the church, give some idea of its appearance. Carved stones from the previous pillars support one of the piers in the north aisle. Stephen Glover, writing in 1844 about the newly-discovered remnants suggested that the church had been built between 1100 and 1150. In 1234 St Mary’s was granted a vicarage, had land in the open fields and was still relatively wealthy. Civic life was marked by the royal grant of a Mayor by Edward I in 1284. The church features in a legend told in the 14th century ballad of ‘Robin Hood and the Monk’, that Robin Hood visited St Mary’s to confess his sins, was caught with the help of a monk by the Sheriff of Nottingham, imprisoned in the dungeons beneath the medieval town hall on High Pavement, and subsequently rescued by Little John. The 14th century was a disastrous period with floods, famine, war and the tragic loss of half the population in the Black Death in 1348-9. Nottingham was showing signs of decay. Writing in 1903 Alfred Stapleton mentions that St Mary’s is recorded in the Inquisitiones Nonarium of 1341-2 as owning St Michael’s Church in the lost village of Whiston which used to lie north of the junction of Mansfield Road and Woodborough Road, and which was destroyed in the 14th century. Records from the Archbishop of York (1327-1340) recommend that the numerous chaplains in St Mary’s church “should participate in all services”, and that Archdeacons’ courts be held in the church. As the Normans and English became more reconciled in Nottingham, people were thankful to have survived and prospered. St Mary’s was rebuilt, supported by the newly affluent merchants and powerful merchant guilds. In 1401 Pope Boniface IX granted a ten year Indulgence for alms to be used for the fabric, conservation or repair of St Mary’s. Extracts from the Borough Records show that building was in progress by 1386 and Harry Gill (writing for the Thoroton Society in 1916) suggests that the old building was demolished as construction took place. However, in the same year the Revd Du Boulay Hill suggests that the new church was built outside the previous one with the theory that services continued in the Norman church while the new one was being built. The new church, completed before 1475, was built in the Perpendicular style of the time in the shape of a Latin cross with a tower at the crossing, huge windows, delicate tracery, and slender ribbed pillars. It is typical of the great mercantile-funded, urban churches that were being constructed at the end of the 14th and beginning of the 15th century. 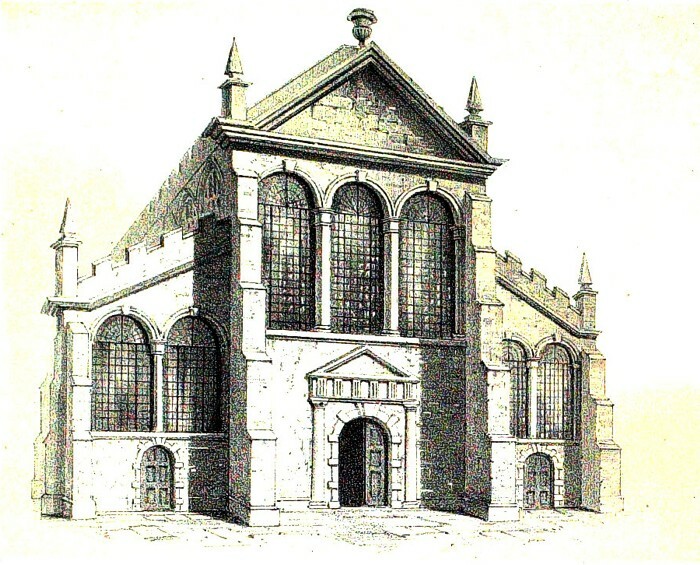 The merchants of the town endowed the new church with Guild and Chantry chapels which were situated in the transepts, isolated from the nave by the great gilded rood loft and screen which extended across the east end of both nave and aisles. In December 2007 a guild roll (a list of members of the Guild of St Mary dating from 1371) was auctioned at Sotheby’s and was saved for the nation by the Nottinghamshire Archives Office and others. The roll of the “Gyld of St Mary in her own church, Nottingham, on the Feast of St Michael, 1371” features the names of 167 members of the Guild and shows prominent local residents included knights, clerks, carpenters, drapers and priests. Thomas Close wrote that William of Wykeham, surveyor of royal works at Dover and Windsor Castle, was brought over from Lincoln to supervise the new building and that the architecture compares with his work on Winchester Cathedral. It has also been noted that the south transept window resembles the East window in Gloucester Cathedral. It is believed that the two carved heads on the doorway in the north aisle represent Richard II and his queen, Anne of Bohemia. Thoroton’s description of the heraldic shields of Richard II and Queen Anne in the great south transept window, which would have placed it prior to 1394, is further proof of the early completion of the nave and transepts. Early floor stones, incised with foliated crosses, dating from this time and earlier, are recorded and illustrated in the Stretton Manuscripts. Today fragments of these are to be found on the ledge at the base of walls inside the church. The Samon tomb in the south transept is similar in design to the porch and is contemporary with the rest of the church. Masons’ marks on the Samon tomb and on columns in the nave identify the work of one man. The church was finished before the addition of the Thurland canopy tomb in the north transept which is dated 1475. 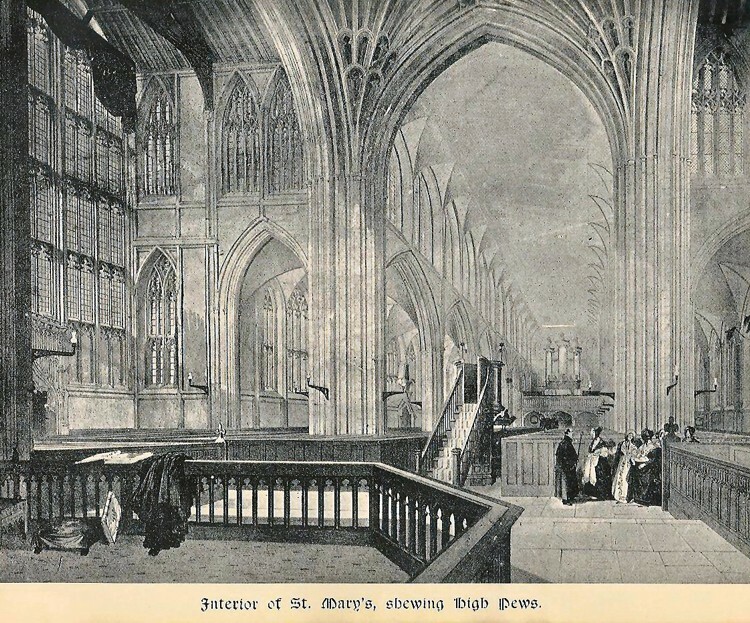 St Mary’s, the town’s largest building, was used for civic and legal purposes including the election and swearing in of the mayor and corporation; it was here that quarrels were settled and oaths taken. In 1467 the Borough Records give an instance of an agreement made on a promise to “swer upon a boke in the parisshe Chirch of Seint Marie.” In the same year an oath was taken in the church concerning the ownership of the weir on the River Trent. The porch was one of the three depositories of the Standard Forest Foot measure. The Forest Foot was eighteen inches and was used in evaluating forest land. In 1504 the cost is recorded of a breakfast eaten “in the chapel on the south side of the Church of St Mary, at a meeting of Mr Mayor and his brethren and of Master Pierrepoint, Master Byron, Master Nevill, etc”. St Mary’s has long been the setting for the election of the Mayor, with a church service to launch their years in office. William de Amyas, John Samon, John de Tannesley, Thomas Thurland, John Plumptre and William Greaves, all buried in St Mary’s, each served as mayor several times. In 1412, 49 burgesses who had previously held office of mayor or bailiff gathered in St Mary’s church for the annual Mayor-making ritual. There was opposition to the choice and a riot followed. In 1512 Agnes Mellers, widow of Mayor and bell founder Richard Mellers, established the grammar school which became Nottingham High School. She willed that prayers be said for her soul and that of Richard at an annual service at St Mary’s. The High School Founders’ Day service still takes place in the church each year. excellente, newe and unyforme yn worke, and so manie faire windows yn itt that no artificer can imagine to set more there. The new rood screen, completed in 1512, stretched between the great west piers of the tower, access being gained from a spiral staircase in the south wall. The former opening can still be seen. The transepts were now home to altars and chantry chapels. When the first English Prayer Book was authorised in 1549 the rood screen was still standing, and in 1559 Alderman William Heskey willed to be buried before it. In 1526 the Crown acquired the valuable tithes of St Mary’s, enjoyed since 1105 by Lenton Priory, but in 1598 it sold the rights to Sir Henry Pierrepont. The patronage remained in his family until 1885, when it was acquired by the Bishop of the newly-formed Diocese of Southwell. the Middle Ages. Click here for details. In 1547 the chantries and guilds were destroyed in what is described as the “Great Pillage”. The income from the Chantry of St Mary in St Mary’s Church and the Hospital of St John, valued then at £14 15s 6d, was given to the town for the upkeep of the bridges over the Trent. Deering quoted the 1625 Register that the chancel had been in great decay and had been repaired by “farmers’ tythe by sequestrating the profits.” He sketched a huge but fading figure of St Christopher which was painted on the chancel wall over the vestry door. Images of St Christopher were often put in churches as a protection. In 1597 a number of fires burned the lath and timber houses of the old medieval town, some of them endangering the offices of the Archdeaconry. The office authorised payment for twenty leather buckets to be placed in St Mary’s to be used for “the quenching of fires”. Thoroton noted that the Civil War had left its mark on the church with the loss of most of the stained glass windows and memorial brasses. In 1643, at the height of the Civil War, Colonel Hutchinson climbed St Mary’s Tower to spy out the land and plan his campaign to take the fort at Trent Bridge, newly erected by the Royalists. From 1635 to 1643 Presbyterian Nicolas Folkingham was vicar. In April 1651 John Whitlock and William Reynolds were appointed as “preaching elders”. A splendid new vicarage was built on Short Hill for St Mary’s around 1651 for their families to share. In 1652 a gallery was built in the church with wood supplied by the corporation, which made a grant of £30 three years later for a second loft. Services at this time comprised little other than very long sermons and no music. After the Restoration, music returned to the church. Music in St Mary’s had been provided by choir and organ in the reign of Elizabeth I. In 1589 the churchwardens’ records mention an organ and the number of pipes it contained. There was an organ before 1642 but there was no music during the Commonwealth. An organ existed in 1675. In 1698 the ring of bells was reconstructed. In 1705 the organ was replaced, a new set of altar rails installed together with a new pulpit with a canopy. The organist at that time also trained the children of Bluecoat School to sing psalms, a tradition continued by later organists. During the reign of Charles II, it became compulsory to display the Royal Arms in a church. 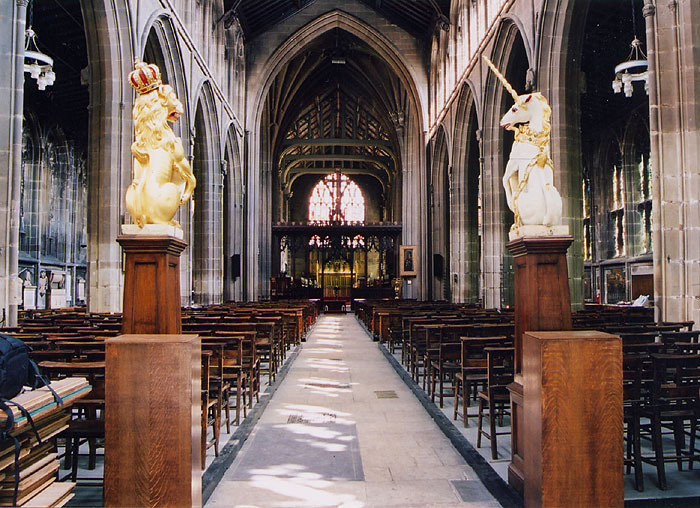 St Mary’s has the Lion and the Unicorn freestanding at the west end of the aisle with cushion and crown above the west door. The Arms reveal that these belong to 1707, the period of Queen Anne. George Fox, founder of the Quaker Society, commenced his ministry here in 1649. His diary records how, as he approached Nottingham, he saw a great “Steeple House”, as he called St Mary’s, and decided to attend the service. He did not agree with what was being preached and interrupted the service, correcting the preacher for which he was imprisoned. His message converted the sheriff, whose name was Reckless, and led to the formation of the Quakers in Nottingham. In 1681 the Borough Records quote an order which was made to take down a number of houses that were built against the south side of St Mary’s churchyard, which were untenanted and therefore of no use to the Corporation. John Plumptre (d.1751) promoted education among the poor, and in 1720 he was first of the Trustees in the Deed founding the Blue Coat Charity School in Weekday Cross. In 1751 people met in St Mary’s vestry on Wednesday and Sunday evenings to educate sixteen poor children. Following a period of fire damage in the town, in 1713 a bill records the repair of a fire engine, including wood and nails. In 1716 the chamberlains were ordered to repair the fire engine again at the expense of the Corporation, afterwards placing it in St Mary’s Church to be ready for duty. 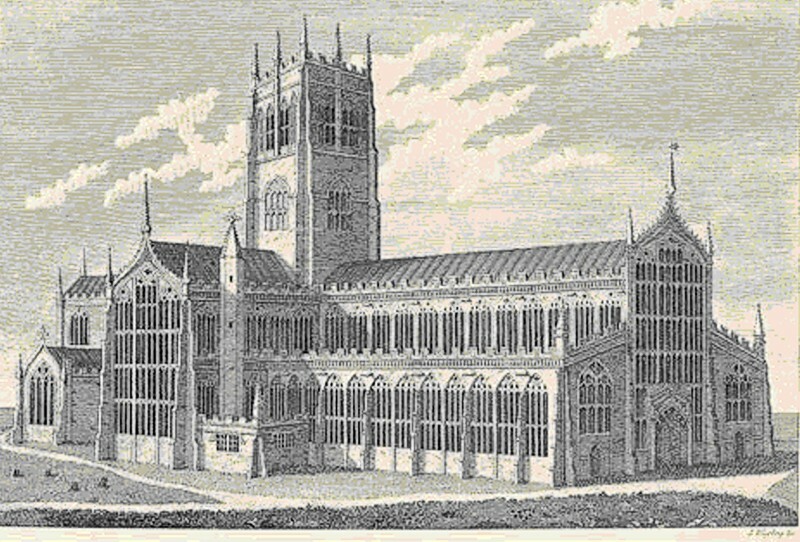 The town fire engine was housed in the west end of the nave as late as the year 1770. In 1722 the churchwardens reported to the Archdeaconry that the church was “out of repair”. In 1726 the west end was unsafe and was rebuilt in the classical style of the period with pediment, urns and obelisks. In 1761 the south side of the nave was refaced and transoms inserted in the windows, displacing the original tracery which can still be seen in the north aisle. the whole is contrived like a Collegiate Church, with Stalls on both sides of the quire, which last being very much decay’d in 1625 … was put in repair by the Farmers … It was again repaired in the Year 1727 and adorned with a very handsome Altar Piece. In 1789 a three-day musical festival was held in aid of the General Hospital and in 1809 a similar festival was held, at which Handel’s Te Deum, The Messiah, and Haydn’s Creation, were performed. £509 was raised for the hospital. By the early 19th century, in a town engulfed in winter darkness, the gates to St Mary’s churchyard were lit by globes of whale oil. The ring holder for the light at the gate at the Hollow Stone corner can still be seen. In 1810 St Mary’s Vestry Society purchased a building on Barker Gate to establish a school for the education of poor boys. The St Mary’s Girls School opened in 1835 close by on Plumptre Place. By 1877 St Mary’s Barker Gate school served infants, boys and girls. The early years of the twentieth century saw a slum clearance programme and the removal of many of the local population. In 1951, after it had been closed for several years, St Mary’s C of E school and site were sold. The school building is still there. It was built in 1799 as a Baptist chapel and changed hands a number of times before being converted into a school by architect TC Hine in 1886. In 1812 there was unrest in the town when the Luddites were active in the area. An attempted rescue of prisoners from the Shire Hall was expected, and a battalion of the West Middlesex Regiment attended service in St Mary’s Church one Sunday morning under full arms and with fixed bayonets. Also in 1812 William Stretton, churchwarden and architect of the church until 1828, supervised the restoration of the vaulting under the tower, replacing the original stone groined roof with one of oak and stucco. In 1815 he stated that the furnace for heating the church was located beneath what he called “St Mary’s Bone House” believed to be the Chantry of St James mentioned by Thoroton. The chimney for the furnace was the north newel stairs at the corner of the chapel, which still has soot on the walls. Access to the cellar remains a mystery. In the 1820s the church was once more in need of renovation. It was full of galleries and box pews which were rented by wealthy families, with insufficient seats for the poor. The Vicar, Archdeacon Wilkins, had difficulty raising the finance for the work. 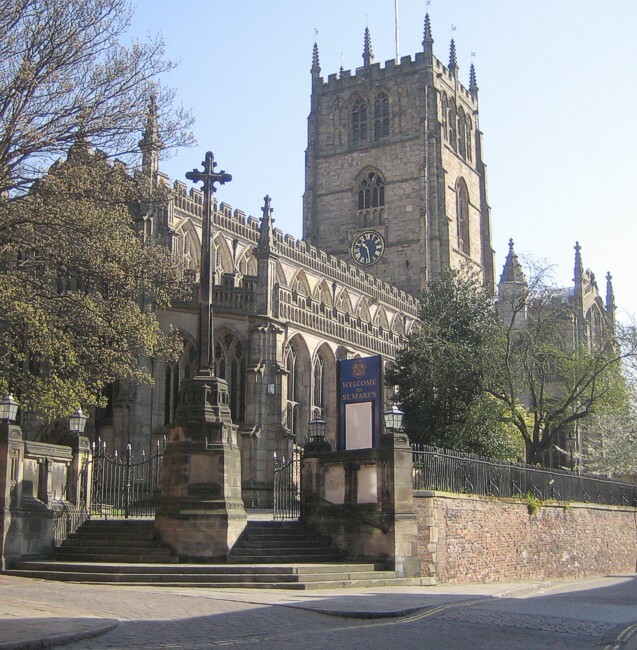 He had a very large church, but his parish was growing rapidly and in 1821 contained over 77% of Nottingham’s population with 32,712 people, many of them living in extreme poverty. With increasing numbers of affluent people turning to non-conformity the financial contribution to the parish was reduced. However, in 1825 the Terrier recorded nineteen charities, established between 1524 and 1817, to aid the poor of St Mary’s Parish, donating food, clothing, cash and coal. Historically, funds had been bequeathed to support almshouses and charities for the poor, the needy and the old. In 1725 St Mary’s parish was granted land for a workhouse, a parish enterprise that was to survive for nearly two hundred years. In 1813-14 there were over 500 people in St Mary’s workhouse and nearly 14,000 existing on charity paid from the parish rates and voluntary subscriptions. The Workhouse was rebuilt at the junction of Huntingdon Street and Woodborough Road but it was demolished when Victoria Station was constructed at the end of the 19th century. The Nottingham Review of 23rd October 1829 reported a service at St Mary’s, part of an annual fundraising to support the Lunatic Asylum which had opened in 1811. The service was attended by President and Stewards, Mayor, Corporation and Governors, who would afterwards dine together and then enjoy a ball at Thurland Hall in the evening. The cost of attending the service was 2s and the cost of attending the meal was 5s. After the service there was a retiring collection to further support the asylum. In 1839 a wall was built across the west of the chancel and the space was dedicated for the constant stream of weddings and christenings. An altar was created on the nave side of the wall which exhibited the Ten Commandments, Creed and Lord’s Prayer and the nave was used for other services. At the same time warm air flues were constructed under the floors of the aisles and gas lamps fitted, one of which can still be seen in the old chantry chapel on the north side of the church. The galleries in the transepts were taken down. This is believed to have contributed to the weakening of the tower support which led to the following problems. By 1842 a rumour had become rife that the tower was unsafe, and this was confirmed by a notice that the church would be shut up, and services performed in the County Hall and St Mary’s girls school room. The architect L N Cottingham was engaged, and it was found that the pier foundations for the tower had been cut away for a family vault. The weight of the tower had also split the foundation stones in various directions and the tower was rent with frightful fissures. The church was opened in April 1843 only to be closed again in October of the same year, when an umbrella fell down, some of the congregation made a rush for the exits thinking the tower was falling down and several people were seriously injured. Dr Wilkins and a Curate tried to stop the panic but to no avail. The church was closed for five years from 1843 to 1848. The four piers of the tower were rebuilt. Meanwhile three tiers of cast iron chain ties, still to be seen, were used to strengthen the tower, and the tower pinnacles were replaced. The Nave and Chancel roof timbers and the tracery in the nave clerestory were replaced. On the corbels of the nave are ten Angels holding shields which replaced the former angel corbels cut away for the previous, plastered roof. The classical west front, which had never been popular, was replaced with a design more like the original. All of this work was carried out by Scott and Moffatt, and the restoration was recorded in May 1848 in the Nottingham Journal. The 1841 census showed that Nottingham had 53,091 inhabitants, 41,135 of whom lived in St Mary’s parish. The population of the town and St Mary’s parish continued to expand rapidly and the solution was to build new churches to accommodate the inhabitants. St Mary’s already had St Stephen’s, Sneinton in its care. In 1822 St Paul, George Street was built as a chapel of ease for St Mary’s. To this was added Holy Trinity, Trinity Square in 1841; St John the Baptist, Leenside in 1844; St Mark, Huntingdon Street in 1855; St Matthew in 1856; All Saints’, Raleigh Street as a chapel of ease in 1864: St Ann’s Church and parish were created in 1863 with St Andrew’s Church created out of this parish, in 1871. Emmanuel, an iron church, was created out of the parish in 1880, replaced by Emmanuel church, Woodborough Road in 1885. St Bartholomew was created in 1903; St Luke, Carlton Road in 1863; St Philip, Pennyfoot Street in 1879; St Saviour, Arkwright Street in 1863. In 1888, a new ecclesiastical district of St Catharine was formed by Order in Council, out of the parishes of St Mary, St Mark, St Luke and St Paul resulting in the creation of St Catharine, St Ann’s Well Road. By 1851, an almost 100% rise in the population had occurred since 1801 and 38 churches and chapels served 57,407 people in the borough of Nottingham. Concerned that this growth had created a mass of church-less people, a comprehensive Church Census for England and Wales was taken. St Mary’s Vicar, the Revd JW Brooks, disclosed that the church could seat 1,800. On 30th March, the day of the census, 740 people plus 800 scholars had attended morning service, 300 people in the afternoon and 800 in the evening. In the Annual Report of 1864 the vicar the Rev Francis Morse announced that they had roughly £3,700 to spend on the windows, but in 1866 he noted that £1200 was now required to make the interior safe, clean and weatherproof. The following year he recorded that over £8,000 had been spent on the church and that it was now “clean, warm and handsome” with a congregation twice as numerous as before. The 1200 chairs were filled on a Sunday evening with people of all classes sitting together, and that many of them would not formerly have come to church. St Mary’s had been restored to the people and the people appreciated the gift. However, as always, there was still much to be done. In 1870 he reported that they no longer had a £1200 debt and that on Sunday evenings the church was used by the whole town, at the Choral Festival by the whole county and that this year at the consecration of the Bishop Suffragan, by the whole Diocese. He pointed out that the church and its choir had a fair claim to a good organ which by 1872 he had achieved, along with other benefits including a new pulpit. 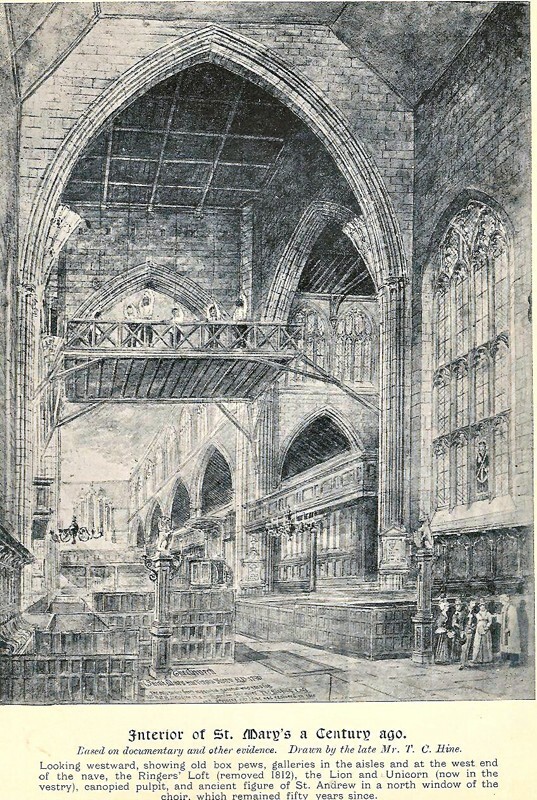 He continued to oversee improvements to the fabric and fittings of the church and in 1888 the new vicar the Rev John Gray Richardson was able to report that the Chapter House was under way and if the tower could be re-pointed the church would need nothing further either for its preservation or for its adornment. The St Mary’s Institute on Barker Gate was built in 1874 on the site of the Salem Chapel. The Annual Reports of 1893-4 described the Institute, opened by the Bishop of Southwell in 1892, as used for parish activities; for St Mary’s Sunday school, youth clubs for boys and girls and for the choir. It was sold in the 1970s. In 1875 Canon Morse, Vicar of St Mary’s, was involved in founding the Nottingham High School for Girls in a group of Victorian mansions. ... ever been the pride and glory of Nottingham, not only as an ecclesiastical edifice but the finest architectural structure of which we are possessed. St Mary’s was built to have the entire population of the town gathered within its walls. In the past the church would have been glowing with colour and gold and with the brilliantly coloured windows he imagined the utter delight to the people of spending “a quiet hour over their devotions” in such a building. He numbered twenty windows that now had coloured glass reinstated in them as the old stained glass windows had been destroyed. 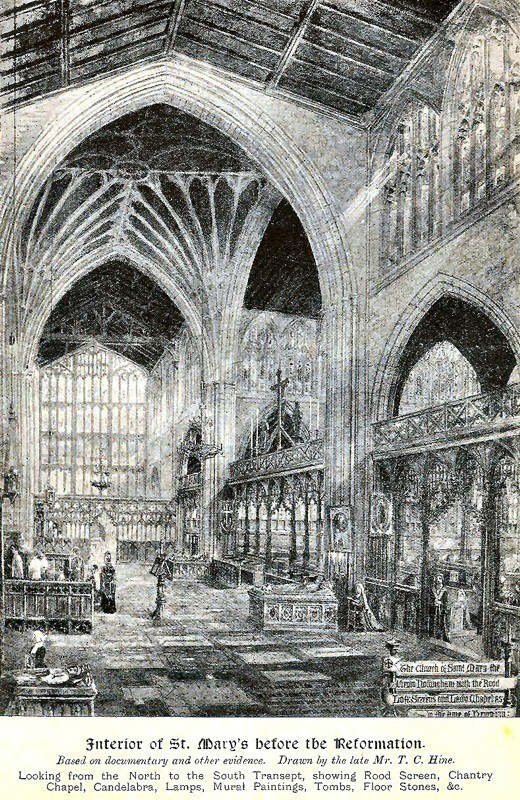 From notes and etchings of church memorials and floor slabs left by William Stretton, and other references, Hine had produced a picture of how he believed St Mary’s looked at the time of Henry VIII, with the chapels, screens and tombs. The entire west end of the church had been replaced twice since 1725, now restored to an appearance more in accordance with the original. He was scathing about the roof under the tower having been constructed of timber and plaster, but mentioned Congregational minister Rev James Orange’s story of boys swinging on ropes from the previous ringing loft onto the floor of the church over pews and pulpit. Hine described the 18th century cushioned box pews and gallery as comfortable, but criticised the rush-bottomed chairs of his time and recalled the stone screen across the chancel, dismantled after cracks appeared in the tower in 1841. He suggested these may have been caused by removing the gigantic beams that had supported the gallery, although another cause was the damage to one of the piers caused by cutting into it for a burial. In 1844 the new vicar had all the alterations of his predecessor swept away and returned the old wooden screen across the nave and aisles, but only twenty years later the entire screen was “pulled down and carted away”, with the full view of the church now restored. 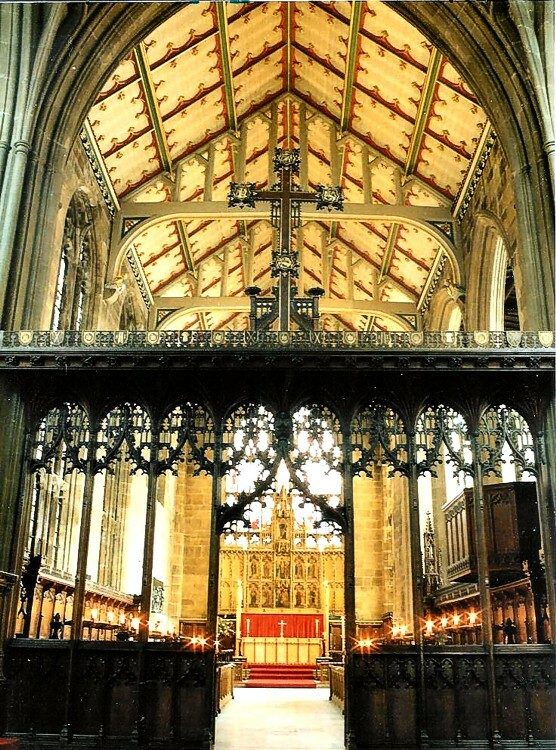 In 1885 a new reredos was erected behind the High Altar with painted panels containing scenes and figures representing our Lord, the Crucifixion, the Annunciation, the four major prophets, Saints Paulinus, Peter, Paul and Augustine of Canterbury, with oak panelling against the east wall and an oak screen at the entrance to the chancel. The church had been returned to a state of good repair. The church was further improved with the completion in 1889 of the Chapter House started by Canon Morse, and continued to be beautified with additional stained glass windows. In 1895 the National Council of Women was founded to try and improve the lot of the lace workers. The first meeting was held in St Mary’s Church, commemorated on a plaque in the north transept. In 1901 St Mary’s parish was recorded as having 3,680 inhabitants, and in 1911 it had 3,538; the church accommodated 1250 people and there were 868 children enrolled in Sunday School. The Vicar was Bishop Hamilton Baynes. The church, now dark with industrial grime, had survived the Victorian transformations but still had another century of alterations as it faced two world wars and massive social change. In 1912 work began on the first of the 20th Century changes with the building of the Lady Chapel at the east end of the church on the south side of the existing chancel, with a gallery to accommodate the organ. In 1921 the Vicar reported that at last the electric lighting was proceeding and in 1922 the War Memorial at the southwest entrance, funded by public subscription, was dedicated to Nottingham and Nottinghamshire men who lost their lives in the Great War. In 1927 the marble pavement was laid in the chancel, paid for anonymously by a member of the congregation. Other extensive repairs and renovations followed in 1935 and 1936. A plaque in the church commemorates the work. In 1938 the Vicar, Bishop Neville Talbot, reported that the parish had been denuded of people living near the church in a manner unparalleled in its long history. He stated that St Mary’s was in the position comparable to a London parish with practically no resident parishioners. During the Second World War St Mary’s church, clearly to be seen on its hill and at the edge of the Lace Market, was in danger of being bombed. Throughout the war members of the church took turns in sleeping overnight in the Chapter House on fire watching duty. Miss Florence Drewry, who died in 2006, described the Lace Market in the blackout, the church in pitch darkness, the fear when hearing overhead planes, the difficulties of getting home, sometimes having to walk to the suburbs and back, and of firewatchers who actually had to deal with the south transept roof fire during an air raid. On the 8th March 1941 St Mary’s was struck by an incendiary bomb and Fireman C Raybould recorded that he and Reg Miller had great difficulty in dealing with the fire high up in the roof timbers as they lacked a fire hose, as they were in short supply, and there was a lack of water pressure. They eventually used a trailer pump and put out the fire but he described the church as “being ringed with fire”. During this time, despite the war, work continued on the church building. The Choir Vestry and other facilities on the north side of the church were completed in 1940. (A number of gravestones in the churchyard, as well as some monuments within the church, had to be moved to make this possible.) The Chapter House had been previously used as a vestry. In 1945 oak panelling was added around the High Altar and on the east wall of the north aisle to form, with an existing Jacobean altar table, the Guild Altar near the pulpit. In 1951 a baptistry was added in the south west end of the building to surround the medieval font. The church was now grimy with many sooty regimental banners and flags hanging on its walls. In 1975 the south porch and north side of the church were restored and the exterior was cleaned of its centuries of black grime in time for the 500th anniversary celebrations. Additional restoration work was needed once more in 1986. It is worth a moment’s pause to remember all the people who have lived, loved and laboured in this church and the brave members of the congregation who passed it on safely through the most dangerous periods in our history to be cherished for this new century. In 2007 the parishes of St Mary’s and St Peter’s with All Saints’ were amalgamated. The nave floor was replaced and under-floor heating installed in 2012-2013. The design of the floor was by Tess Jaray R.A., the architect was Peter Rogan and the work was carried out by Midland Stonemasons. When the raised pew platforms had been removed the substrate was cleared by hand to a depth of 45cm and in the north-west section a number of burial vaults were found. AD GLORIAM DEI, TESS JARAY R.A. ARTIFEX, KIRSTEN & GORDON SOLWAY DONATORES, ANNO DOMINI MMXIII. During the excavations numerous archaeological items other than the grave vaults and coffin furniture were found including painted glass, floor tiles, pottery and lead window came. In October 2015 following a lottery grant the lead on the nave roof was recycled, melted down, re-rolled and re-laid. The work was completed by Easter 2016. At the end of August 2017 the Revd. Christopher Harrison resigned his position at St. Mary’s to continue with All Saints and St Peters. On 1 January 2018 St Mary's Church was re-established as a parish in its own right and the city parish of All Saints, St Mary's and St Peter's was dissolved.